Applique by hand can be tricky. I am not one that loves the slow process of cutting, and hand sewing and tend to keep to the smaller projects if I go there. After hitting a couple of problems, and thinking that a few of you out there might be having similar issues….I have come up with a list that helped me. If you are having issues with your applique fabric fraying while you are turning it for stitching, you may be using dull scissors to cut the applique shapes. Applique scissors are extremely sharp. Very sharp scissors cut fabric fibers very precisely, which will help prevent fraying. Pin the applique shape to the background from the back of the fabric. Placing the pin on the wrong side will prevent your thread from catching on the pin when you stitch. Using smaller pins and glue can help eliminate catching the thread on them, and is great for small sewing kits. Keep applique stitches no more than 1/8 inch apart. If stitches are farther than 1/8 inch apart, tiny gaps will form along the edges of the applique. Those gaps can form point and make your curves and shapes a little pointy. Study the applique design and determine in what order the pieces will need to be sewn in place. Number the pieces to remind yourself of the required sewing order. Begin with the pieces that are in the back of the applique design and work forward to the pieces that lay on the top. The areas on background pieces that are covered by pieces in the foreground do not have to be stitched, as they will be held in place by the foreground. Recognizing those areas in advance will save you unnecessary stitching time. If your applique shape has curves…either concave or convex, they will need to be snipped so they lay properly when turned and sewn. Inner (concave) curves should have small cuts and outer (convex) curves should have small notches cut out. Snip only if you need to as it creates a weak point in the fabric. Sew appliqué shapes in place with thread which matches the appliqué, not the background fabric. This allows the thread to disappear into the shape and hide itself– just incase a stitch shows. Also- pay attention to the thickness of your thread. The thicker it is, the more likely it is to be seen. 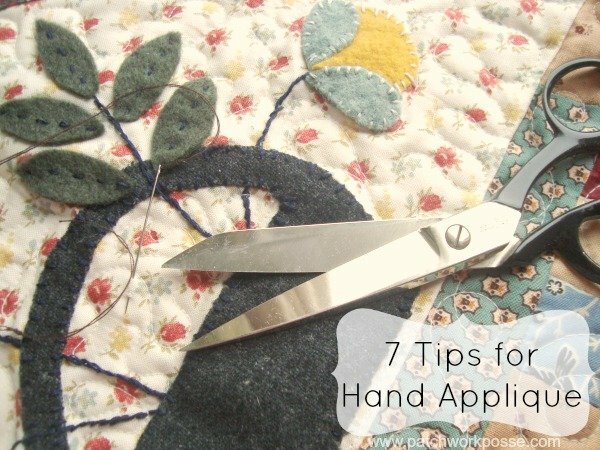 Use a very thin thread for hand applique. If working with templates, you should check whether or not they include a seam allowance. If they do, you should draw around the template and cut out on the line. Any seams should be sewn 1/4in from the line, unless indicated otherwise. Need some additional help? 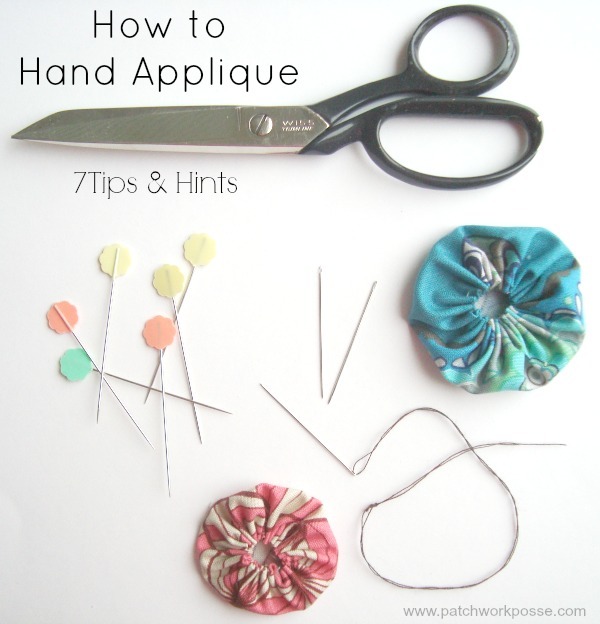 or want a few extra tutorials to show you the different techniques for applique– Here is a How to hand applique tutorial, applique one layer or more, using fusible web, and here is all the applique posts on the site so far. That is a lot of great advice. Thank you! Becky, I love how you just get right to the point and give us fabulous tips and advice…We hope you have a great day!